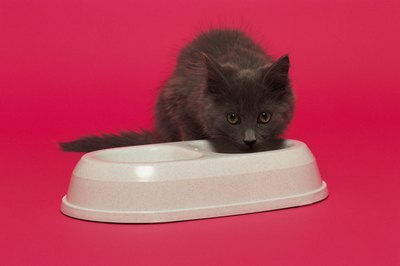 Cat food designed for sensitive stomachs can alleviate IBS symptoms. You love your kitty, but you have to dodge piles of kitty mess on the floor and clean runny poop in his litter box. Irritable bowel syndrome can be messy and stressful, but the right food and care can mean more cuddles and less cleanup. Irritable Bowel Syndrome, or IBS, also called Inflammatory Bowel Disease, or IBD, refers to conditions that affect your kitty's digestive system. If kitty is throwing up, having diarrhea, eating less or losing weight, he may have IBS. The condition has several causes, such as dietary allergies, parasites or bacteria. According to The Cat Health Guide, up to 50 percent of cases are caused by a cat's diet. He may be having a reaction to the milk protein lactose or carbohydrates, since these are common culprits for feline IBS. If you're constantly cleaning up after kitty, you may try a change in diet. Some foods are easier to digest than others and less likely to cause gas, diarrhea and vomiting. Look for ingredients like egg protein, rice, oats, wheat, and chicken or turkey when buying commercial cat food. Science Diet, Purina One, Royal Canin and Eukanuba all make quality food formulated for sensitive tummies. Whenever switching food, do so gradually to avoid upsetting his tummy further. Ask kitty's vet which food he recommends. Just like for humans, probiotics show a lot of promise for treating IBS in cats. Probiotics are “good” bacteria that are naturally found in kitty's digestive system. These good bacteria help him fight off the bad bacteria that can cause not only IBS, but also urinary tract infections. Look for foods and treats that contain probiotics to boost his digestive health. Other supplements such as Omega 3 fatty acids, sulphur, podophyllum, alchemilla vulgaris and plantain (plantago major) have shown to reduce IBS symptoms as well. If you feel like you've tried everything and he is still having trouble with vomiting and diarrhea, his vet may give him a prescription to help. Glucocorticoids suppress his immune system and reduce inflammation of the bowel. A protozoa called giardia can cause similar symptoms to IBS, so his vet may prescribe a medicine like metronidazole or fenbendazole that he'll take for about a week. Kitty's vet can may also try a prescription cat food designed for kitties with irritable bowels. What Can Cause a Cat to Hiss?